The core teaching on the Sunday of Thomas: always stay close to Christ no matter what the understanding says, because of love. 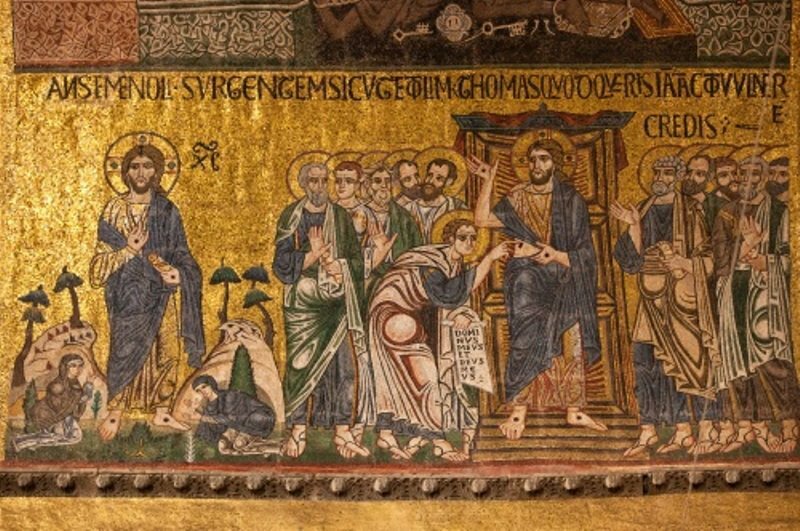 Synopsis: The story of the "unbelieving disbelief" of Thomas, always read on the Sunday after Pascha, and also several other times during the year has one core message that applies to every human being. We look at this, and the only reason Thomas stayed with the Apostles through the eighth day, when He saw Christ – love. Without love, and the actions of Thomas replicated in *our* lives the resurrection will be of no good effect for us. the Christology and theology in this selection is deep and important, but the example which we must learn is of even higher importance. 2nd Sunday of Pascha; Thomas Sunday. Realism About The Resurrection. Text and Audio. Today, brothers and sisters, we have the second half of the story of the Apostle Thomas. When I think of the Apostle Thomas, I like his story, I think, among all the Resurrection stories, the best of all because I really think his story fits us to a T. Or, it should fit us! It fits those who endure to the end. It fits those who find their way, who bear fruit. It doesn't fit anybody else. Let’s put is this way: if we are to bear fruit, we must be like Thomas. If we are to be fruitful in the Christian life, our life is going to resemble his. And why do I say this? I think Saint Thomas is sort of like every man. A complex person, with belief, but also with unbelief, with certainty but also with anxiety. This is what Thomas experienced. He couldn't believe that the Lord was risen, he didn't see Him the first day that He was risen. He didn't see Him until the eighth day. And in that intervening time he just couldn't believe. Now, someone might judge him for that, saying, why wouldn't he believe his friends? Many witnesses had told him that the Lord was risen. Well, there's a lot of things that we don't do right. There are a lot of things that we get wrong, a lot of misunderstandings that we have, a lot of stuff that mixes up good and bad in us, so that it's hard to know why we do what we do or why we don't do what we should. Thomas is just like us. And he couldn't believe. But what did he do? He didn't leave. He stayed with the apostles. Imagine how his heart was aching when he wanted to believe. He just couldn't. You see, partially, belief is a gift of God. It's not just to sit in a corner and believe. God grants us to be able to believe. He doesn't force us to believe, but He helps us. You know all those confusing thoughts that go on in your head? If they just keep going around and around and around, you get so turned around you don't know which end is up. That's how Thomas was. And we need divine intervention for things like that. There's a lot of things in the world that are very curious, very strange, very terrible. We don't understand why they happen. So we're like Thomas. But we do understand that God loves and God is perfect and that somehow His plan will always be realized. We just have no idea how. No idea. But like Thomas, if we continue to struggle, continue to be with God, eventually it will become clear to us. So, like so many stories, the story of belief of St. Thomas after his unbelief, is life in microcosm. Learn to read the Scriptures in this way. Because constantly it is life in microcosm. So many of the miracles, the parables, this event, are showing what life is like. Now, for Thomas it took eight days. For us, it takes a good part of a lifetime or perhaps a lifetime for some of our problems to be solved, for some of our confusion to become more clear to us. But we must be like him. We must be with the apostles. We have to pray. We have to fast. We have to do things when they don't really give us much pleasure or they don't touch us much. But we know they are right things to do. I'm not talking about doing things because of some legalistic idea that we've got to do this and we've got to do that. Christianity is not legalism. People make it legalism because it is actually easier that way. Christianity is to give your entire heart to God. There's nothing legalistic about that at all. It's just giving all of yourself. But it's really hard. Because there's things that pull you back. Just like Thomas. So you keep going, keep making mistakes. Sometimes you believe firmly. Other times maybe you have doubts. Sometimes you're happy. Sometimes you're sad. Sometimes you're confused. Sometimes you seem to understand. That's what life is like. You know, the Resurrection has to be looked at realistically, from two perspectives. Number one, the Resurrection is happening now within us. I talk about that all the time because I don't think we live like that, but the Resurrection is truly transcendent and should affect everything you do, everything you say, everything you are, should be affected by the Resurrection. But also we're like Thomas. And there are parts of us that are not quite affected by the Resurrection yet. There's still darkness in us. There's still confusion. There's still anger and passion and all kinds of stuff. The Resurrection is supposed to fix all that, and it will. It doesn't happen to the apostle. It doesn't even happen on the day of Pentecost. It happens through our lifetime of struggle. So that's what I mean by being realistic about the Resurrection. We can't just say it's Pascha, Christ is risen, happy, happy, happy. Because there's still things in us that should make us not very happy. What should make us happy is that they can be solved. They can be changed. Thomas wasn't real happy, for eight days he wasn't happy. Imagine how broken his heart was! He had said he would go die with Him, but he had run away just like everybody else. And now he didn't even know if He was alive or dead. I'm sure there was a piece in him that believed. But there was also all that other stuff in him, probably guilt to a large degree, confusion, that wouldn't let him completely believe. It wouldn't let him have the joy of the belief. And it took the Lord, seeing Him, and converting him for Thomas to be able to have this joy. We're just like him. If not in eight days, in our lifetime. This is the blueprint for how to save your soul. It doesn't matter if you have sins, doubts, unbelief. None of that matters if you're like Thomas, if you struggle. Because, no matter how much you have doubts inside, you know what's true. Sometimes that truth can't quite get out because of your weaknesses. But it's there and you know it. And God is going to help you get that truth out. When I talk of truth, the truth is not a concept or a fact. Truth is Jesus Christ. Truth is righteousness. So you want to be righteous, and yet there are things about you that aren't. We're celebrating the Resurrection, but not all of us is resurrected. I don't think we should pretend otherwise. It's just true that we're not completely resurrected yet. We should be, and God will help us to be. And the path is the path of Thomas, of fidelity, of struggle. Like the man who said, "I believe; help my unbelief." I think this Thomas is just another application of that idea. He believed, but he couldn't believe completely. He just couldn't quite believe completely. And that's because he had to struggle and God would grant him the ability to believe. But He only grants this ability to those who struggle and those who try. Those who are lackadaisical, they are not going to be able to find their way. Brothers and sisters, I've told you many times, I want you very much to feel that there's darkness in you. Not because I want you to be miserable. It's not about being miserable. It's about being realistic. It's about knowing what you are and what you will be and having a great desire to be that person that you will be. Wanting that above everything else. As a pastor, I shudder when I encounter people that don't seem to have a concept of who they are. They don't seem to know that they've got black in them and that they've got passions. And when they do talk about some passion, it's, well, you know, “I'm only human”. Well, I'll tell you what. “Only human”, from a Christian perspective, means to be like Jesus Christ because He is the model for what a human being should be. So actually when we say that, we really shouldn't say, we're “only human”. We should say, we're not really human yet. But we will be, if we are like Thomas and if we just endure. Maybe it will take a week. Maybe it will take a month. Maybe it will take fifteen years. I've been now a priest for fifteen years, and stuff is still happening, and I'm still waiting. I believe it's going to happen. I don't know when. I don't know how. But I know that if I stay close to the church, struggle, pray, fast, fall down and get up, then God will enlighten me; and those that I love, my flock, my family, God will enlighten them too. Not according to my timing. My timing is "right now." It's not God's timing. Thomas wanted to know right now that the Lord was risen. That wasn't God's timing for him. He had to endure what must have seemed like an eternity, of eight days of waiting. But eventually God revealed Himself to him, and He will reveal Himself to you, but only if you're like Thomas. Since we are like Thomas in our failings, we must be like Thomas in his endurance, or else we will not be saved. So God help you to endure: To pray when you don't feel like praying, to repent when you don't feel like repenting, to forgive somebody when you don't really want to forgive him and when he doesn't want to give you any advantage whatsoever. God will help you. And God will enlighten you. And you will know how to do it. As Thomas was able to say, "My Lord and my God," so will you be able to say that. I don't mean say it with your lips. I mean have it, the feeling of it, everywhere in your whole soul and the certainty that knowing that He is your Lord and your God and you are His child. This is what our aim is in life. May God help us to get there, like Thomas. May all of us have an eighth day and we see the Lord as He is and we're not ashamed. Amen. Transcribed by the hand of Helen. May God save her and her loved ones. 2nd Sunday of Pascha; Thomas Sunday “Believing disbelief” is the most important part of the story. Text and Audio. Thomas Sunday. "Believing disbelief" is the most important part of the story. "Believing disbelief" is the most important part of the story. Christ is risen! Christos voskrese! Christos aneste! This is now the eighth day of Pascha; on the eighth day, the Lord visited the disciples with Thomas being present. He had been absent on the day of the resurrection. Let us go through some of the important theological points of this reading, and then, saving the best for last, the most practical and the most important for our spiritual life. On the day of the Resurrection, the Lord comes to the disciples, minus Thomas, and He goes through shut doors because, of course, He's God; He can do anything He wishes. The first words that He says to them are, "Peace be to you." This is very important. One way of describing the goal of life is to have peace because, if there is peace, there is God. And they will achieve this peace, not with a peaceful life because there will be many things that will happen to them and they will all be martyred save one. But they will have peace in their heart because God will abide in them. Then He breathed on them and said: “Receive ye the Holy Spirit.” In Scripture the breath is often indicative of wind, and the wind is indicative of the Holy Spirit because the wind blows where it wills, but we know not how it does it. It's the same way with the Spirit. That's what Jesus explained to Nicodemus. To this day the priest, when a baptism is conducted, the priest will breathe on the one being baptized three times in the sign of the Cross. This breath is not the giving of the Holy Spirit. It is indicative; it is a symbol of the Holy Spirit. And when Jesus said, Receive ye the Holy Spirit, they did not receive It; He was speaking of what would happen in time. He was basically prophesying because our Lord was all things so He was also a prophet, as well as God, as well as a King. The Holy Spirit would come on Pentecost, fifty days after Pascha. He also said to them, "Whosoever sins you remit, they are remitted unto them, and whosoever sins you retain they are retained." And that is why we have the practice of confession with a priest in the presence of God. And then the priest has the awful responsibility of determining: Has the person repented of their sins? Repentance is the only reason why a person can be forgiven. Repentance is the desire to change; your sins are forgiven, if you have desire to change. Please note! You may not be very good at changing! You may still be a weak sinner, with the need for healing and strengthening of the will. God does not forgive based on your personal perfection, but only on your honest desire to change and reach perfection. Now, Thomas saw the disciples, perhaps on the same day, but after the Lord had seen all of them, and he could not believe. In fact, he was very explicit about why he would not believe. He said: "Except if I see in His hands the print of the nails and put my finger into the print of the nails and thrust my hand into His side, I will not believe." This is not the recommended way to speak about our Lord Jesus Christ! It was a blunder on his part. Clearly! But even though he blundered, he waited and he still was with the disciples. And then Thomas says something very important; the first time ever in Scripture that the Lord is declared to be God and Man: "My Lord and my God." That is indicating that Jesus Christ has two natures and is God and Man. So Jesus says to him, "Thomas, because thou has seen Me thou has believed? Blessed are they who have not seen and yet have believed." And this ties in with the most important part. It is important to know theological facts about God. To know dogmatic things and be correct, that God is Trinity, Jesus Christ was born of a Virgin, the Holy Spirit proceeds from the Father and is given to the faithful through Christ. Those things are all important. But none of it matters if you don't endure to the end because if you give up, then you will not receive the things that you are striving for. So Thomas, although he made a terrible blunder when he said he would refuse to believe, he stayed with the apostles, even though his heart was broken, even though he did not believe. But one can say that it was not a hundred percent that he did not believe. There was some part of him that hoped, and that part of him kept him with the disciples. And that is the most important part of this reading, brothers and sisters, because all of us are a lot like Thomas. We make blunders, sometimes serious ones and sometimes we do have doubts. If you're honest with yourself, you will believe this; you will know this. And if we are like Thomas, we stay with prayer, with fasting, with the church. We don't give up. And God will always enlighten us, every time. It might not happen in the timing that we want it to happen but it will always happen. Now, why do you think this story of Saint Thomas has been preserved? It's an interesting story, of course. But why was it preserved in the Gospel? Why was so much time spent on it by Saint John? Well, if you look at the day of the Resurrection and the aftermath, it was difficult for people to believe in the Resurrection. Our Lord had told them all about the Resurrection many, many times. He told them about the sign of Jonah and told them many times what would happen. And then it happened exactly as He said. And then He died. And then they saw Him no more. And then on the day of the Resurrection, some saw Him and some didn't, and the ones who didn't see Him just couldn't believe until finally He appeared to everybody. The Resurrection is difficult to believe in. Now, okay, we can say we believe in the historical event of the Resurrection. We can say, oh, it's easy, of course: “I believe in the Resurrection; I'm a Christian.” Is that the case? If you truly believed in the Resurrection, you would never sin, because the purpose of the Resurrection was so that you would become perfected. There is only truth in the Resurrection and the One Who is resurrected, Jesus Christ. Nothing else is true. Nothing else matters. Nothing else has any substance whatsoever in this world. So the more you live according to the Resurrection, the less you sin and the more peace you have. It's difficult to believe in the Resurrection, that is, to always live according to it, because you see things in life that contradict it. There are things in your own life, the things you do that you shouldn't do, the things you don't do that you should do. And yet we call ourselves Christians. How do you deal with this conundrum of having belief and yet unbelief? The same way Thomas did. You stick with the Lord. You keep praying. You keep fasting. You confess your sins and you struggle. And as God reveals to you things about yourself, you change them, with Him helping you. And then He will reveal Himself completely to you, as you are able to see Him. If we are full of sin, we can't see the Lord very well at all. It is as if we have eyes with cataracts on them. But those scales will fall away if we struggle, and that's what Thomas did. He made a blunder; let's be honest about it; it was not intelligent what he said. He had heard the same things that the other apostles had said, and now all of his friends that he had been with for three years told him, "We have seen the Lord," and he would not believe. But he would also not go away. So let's learn that from Thomas. Let's understand that living according to the Resurrection is hard, and it is our purpose in life. So let's stick with the Lord, by prayer, fasting, coming to the Services, even if they don't touch you. Sometimes they don't. Sometimes prayer is flat and dry. Sometimes reading the Scripture is difficult or even boring or even confusing. Do all those things. And the Lord will enlighten you as much as He enlightened Thomas. May God help you in all things. Amen. Transcribed by the hand of Helen.May God save her and her loved ones. Of course, the fulfillment of the prophesy “receive ye the Holy Spirit” was accomplished on the day of Pentecost, 50 days after Pascha. Synopsis: There are several important parts to the story of the encounter of the Apostle Thomas with the risen Lord, such as why the first words Jesus spoke to the assembled apostles were "Peace be unto you", the promise of the sending of the Holy Spirit and the power that Jesus gave to His Apostles to remit sins. The most important gleaning from the reading is none of these, but is understood in the blunder of St Thomas, and his subsequent behavior, which led to his full enlightenment, and gave him the privilege to be the first to proclaim in the scripture that Jesus is fully God and man. We are all much like Thomas in his mistakes; let us also investigate his great virtue, which the church calls "believing disbelief", without which, scarcely one would be saved. Synopsis: Five minutes in between Vespers and Matins at the Vigil for Thomas Sunday about the closing of the altar doors, which have been open all of Bright week. There is profound and sobering symbolism concering the closing of the doors which we should understand. SYNOPSIS:Of all the resurrection stories, perhaps the one concerning St Thomas is the one we can most relate to. He is the "common man", who was later able to do uncommon things. We are just like him, so our path of life must also be like his, which is the Christian life in microcosm. He, like us, was a complex indivicdual, believing, then faint of heart, couargeous, then full of fear. The one thing that he did that we must do to be saved is to endure, and "believe in the midst of our unbelief". If we do this, we are not far away from the supernatural exploits of St Thomas, the Apostle. 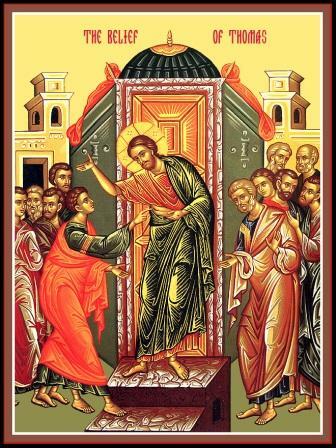 You are currently browsing the archives for the 2nd Sunday of Pascha – St Thomas Sunday category.